Celebrate and support the LGBTQ+ community at the 3rd annual event, “Bethel CT Pride 3rd Annual LGBTQ Parade & Celebration”! Music, food, speakers, artists, vendors, and more in downtown Bethel, CT! Visit bethelctpride.com or follow Bethel CT Pride for more details! Hosted by Bethel CT Pride. The Bethel CT Pride LGBTQ+ Parade and Celebrationprovides the opportunity to come together in celebration of the LGBTQ+ community and equality. Bethel CT Pride is the first and only LGBTQ+ pride parade in Northwestern Connecticut, a tradition we look forward to continuing for years to come. In 2017, our inaugural event brought over 500 attendees to the downtown Bethel area, a number we were pleased to match at the 2018 celebration! Bethel businesses benefit from the surge in customers and the opportunity to serve the community, fostering a sense of camaraderie with local patrons and establishing relationships with new clientele. In addition, our Bethel CT Pride social media channels allow us to connect with community members year-round. Our primary channel, @BethelCTPride on Facebook, carries a following of 490+ and continues to grow. Our total organic reach of our 2018 event hit 35.4K! We also have a following on Instagram, Twitter, and Telegram that allows us to further widen our reach. 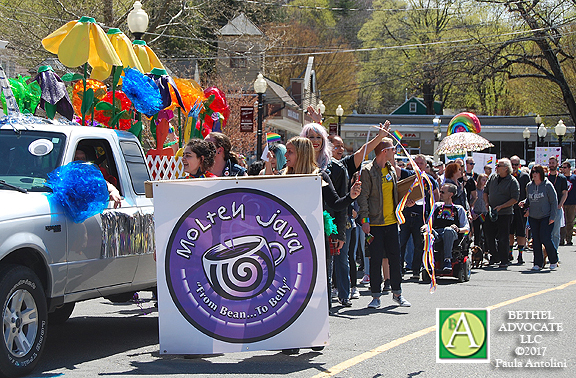 By becoming a sponsor, your contribution will not only help cover costs related to the Bethel CT Pride LGBTQ+ Parade and Celebration, but also allow Bethel CT Pride to grow the event for years to come. Click here to become a sponsor. *The first ten LGBTQ+ non-profits to register will not be charged a vendor fee. These spaces will be scaled to a 10’x 5′ spot if the event must be moved indoors due to weather. Pay your reservation fee to secure your spot. Did you know the entire parade is run by volunteers? There are a ton of things that go into creating this amazing day and we are always looking for more brains and brawn to pull it off! Whether you want to help ahead of the event day or volunteer during the parade, we want to hear from you! Click here to be a volunteer.Click here to be a volunteer. We invite your group to march in the Bethel Pride Parade! Groups supportive of LBGTQ+ rights are welcome to join us in this peaceful and joyous march. To participate, please follow the steps below and be sure to download our helpful guides. Click here for more information on marching in the parade. 1:30 PM – 5 PM Celebration! VIEW VIDEOS AND PHOTOS OF PAST EVENT HERE.